Multiple RMS handling subs on one amp?? is it safe?? If I hooked Sub box one (4ohms)(600RMS, overrated, 450ish RMS in reality), up to sub box 2 (2 ohms)(800RMS), it would drop the total down to 1.5 ohms, would it destroy one of them? I.E. would each box be getting half of the power? Amp = 450 watts RMS. Would each sub end up getting 225, causing the little sub to blow up? Any info would be appreciated. in conclusion don' do it.. just use the 2ohm sub as it's obviously better. Sub B = 2 Dual 2 ohm subs wired series. So in reality, I have a pair of 4 ohm subs (audiobahns), and a pair of 2 ohm subs. So if the electrical flow is based on individual impedances, not what it's been wired to... in reality, each dual would get 444, and each audiobahn would get 222? 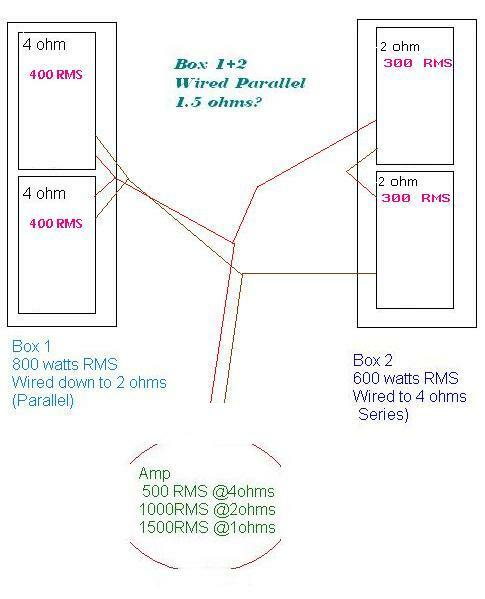 (Since the audio's are 4 ohms each and the dual's are 2)? and don't say 888W... i just used 1amp to do the math to show that it would be double... but the current is just a parameter that can easily be changed. Ok, first, what would the total ohm load be? Is 1.5 correct? Or is it 1.33? Second, would each sub be taking in the same amount of power, since it was all one big circuit at that point? Or, would in fact the 2 ohm subs be taking more? Or the 2 ohm box? Just trying to figure out if I did something like this, how much power each sub would get...dont want to underpower the big ones, or overpower the ones that handle less..
To understand why series and parallel configurations have the effect on resistance that they do consider this. When you connect speakers in series current must flow through both speakers and so it hits the resistance of both speakers. When you have speakers in parallel, the current has multiple paths since it can go through either speaker so the equivalent resistance is always lower than that of either speaker alone. also the resistance of the speaker depends on the frequency the speaker is playing. For example, a speaker may have a 3 ohm resistance at 80 Hz and a 9 ohm resistance at 300 Hz. If you were to make a plot of resistance versus frequency you would get what is called the impedance curve of the speaker. Also, speakers act in some ways as inductors and capacitors so a true model of a speaker must include those components as well. How does this affect the sound you ask? Well if you have an amp that has very weak current capability it may work fine into perfect 4 ohm loads but when you connect our real speaker which has an impedance dip at 80 Hz the amp may have difficulty and smear sounds that have 80 Hz components. These are minor but audible effects. This is why it is good to get a 2 ohm stable amp even if you never plan on running 2 ohm loads. I would stick with one or the other not both of them. that is ugly.. as i said before it is 1.33ohms. James is right with the exception of speakers acting like inductors and capacitors... speakers are coils... they act as inductors because they are inductors.. not capacitors. Impeadance will very much change with frequency and I'd have to agree in saying stay away from combining all of that mess you have up there. each 4ohm(400wrms) sub will get 1/2 of the 66% power meaning 1/3 of the power will go to each of them... likewise each 2ohm(300wrms) sub will get 1/2 of the 33% power meaning 1/6 of the power will go to each of them.